Jesus died for your sins, your health and your soul. He was resurrected with all power over sickness, sin and death. If you really BELIEVE, you can be healed. You can be well. You can be made whole. If you really BELIEVE, you will begin to take faith steps, one at a time, to change your eating habits, exercise habits, prayer, devotional and Bible study habits. Then, you will see the fruit of your labor. Mark 16:17-18 reads: And these signs shall follow them that believe; In my name shall they cast out devils; they shall speak with new tongues; They shall take up serpents; and if they drink any deadly thing, it shall not hurt them; they shall lay hands on the sick, and they shall recover. That’s a BIG promise from a BIG GOD….but remember Faith without Works is dead. Spiritual food is the most important component for your healing. Jesus is the Word and the Bread of Life. In Holy communion, His body is the bread that was broken for you and his blood is the wine that was shed for you. Since faith comes by hearing, and hearing by the Word of God, then reading, studying and meditating on the Word is very important. This builds your faith as you realize who you really are to God. You are the apple of his eye. You are fearfully and wonderfully made. You are made in His likeness and His image. He loves you, but you will never understand the depth of that love until you get into His Word. Read the Bible daily. Substitute the programs you watch on TV for Christian education and entertainment. For many, this is a stronghold that is hard to break. Allowing your mind to be filled with lies, deceit, murder, adultery, homosexuality, profanity, fornication and all the things that the world uses to entertain, makes YOU the biggest obstacle in your own spiritual development. In addition, the Apostle Paul said, that people who indulge in these things will not inherit the kingdom of God (Galatians 5:16-26). Keep in mind that anything you are not willing to put down for the love of God (to increase your relationship and intimacy with Him) is an idol. In your addiction to it, you have placed it higher than your love for God. Loving Jesus for who He is and what He willingly did for us on the cross is the beginning of ALL healing and understanding. His love will cause you to forgive the unforgivable; to have uncommon mercy and compassion; to make Jesus Lord of your life, not just a spectator of it, and to forgive and love yourself. Together with Him, what is damaged can be repaired. Natural Food is also a vital component of your healing: The U.S. food supply is so contaminated that it is not even safe to eat. The information about what is in your food is available, but many people (and sadly many in the body of Christ) do not care. Healing is in the untainted food that God created for the nourishment and healing of your body. Growing your own food or spending a little more for organically grown or grass fed animal food products is a worthwhile investment. After all, you would not fill the fuel tank of your car with just anything. You use what makes the car run well, and if you don’t, the car will not work as well or as long as it was intended. It’s the same with your body. Isn’t your body infinitely more valuable than a car. There is no trade-in value for the body until He transforms our lowly body to be like His glorious body. (Philippians 3:21) Natural food is like manna from heaven. It was put on this earth at the time of creation for our pleasure. It is food created by the hand of God. Why would you choose junk over God’s best? God has given us everything to eat, without restriction, but much of what we eat is not even real food, yet He still allows us to choose it.Therefore, I’m not talking legalism here. I am talking optimum health through wise choices. In order to get all the vitamins and minerals we need (because we don’t eat the full spectrum of foods to support our health, supplements (made from natural ingredients) can also be helpful or even needed. Each of us is different and we have different struggles with illnesses of different degrees. We need only to listen to the Holy Spirit and his messengers to draw on God’s wisdom about what is good or bad for our own bodies without judging others, but caring for them and setting a good example for healthy, godly living. I am dedicating my life to spread this good news to those in need of healing. Exercise is a necessary component to be strong and an important part of being healthy and whole. There is no escaping this fact. Even doctors prescribe it. However, with the introduction of yoga to western culture, many doctors are recommending it as a way to increase flexibility, stamina and to manage stress. This is not good for Christians. 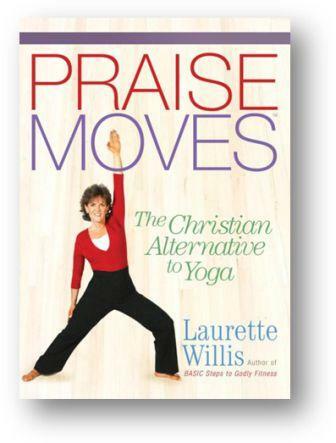 Every yoga pose offers worship to over 330 million false gods. There is no disputing it when you open your heart to accept the truth. In closing, below are links to products that will help you reach your health goals. By purchasing these products, you support this ministry and the ministries that it supports. We appreciate you and we love you.